HomeDr. Sama Banya - PuawuiRemembering Tejan Kabbah? I like the following story, which makes me chuckle every time I recall it. It was at the vigil or ‘wake’, held in memory of a deceased member of society. (Photo: Kabbah and Sama Banya). His widow, who was seated in a place of prominence, as is usual on such occasions, listened attentively as speaker after speaker paid glowing tributes to her late husband. There were such attributes as the perfect family man, friendly, generous, helpful, benevolent, a great asset to the society, and so on. She would not believe that all the compliments she was hearing were directed at her husband. She had known the undisguised contempt with which some of the speakers had regarded the late man; how others had habitually badmouthed him and much more. And now, she was listening to such beautiful sentiments, with speakers bending over backwards to give those excellent testimonies of her husband, whom up to the time of his death many had almost regarded with contempt. I was reminded of this story, almost from the moment of death of the late former President Ahmad Tejan-Kabbah (Photo), and throughout the week of official mourning, up to and including the day of his state funeral. One heard it on air, in ordinary conversations and discussions, and read it in the print media. Although it is said that one must not speak evil of the dead, but that notwithstanding the late man’s character, his career achievements and the way he stuck to democratic principles, his commitment to the development of the country and especially his bringing peace to the country – after eleven years of a most brutal rebel war – were being told with relish and in superlatives. I would sometimes exchange an understanding nod with his widow I.J, as Mrs. Kabbah was fondly known and addressed. Her late husband had been held responsible, even by some of his own party members, as being personally responsible for the SLPP losing the Presidential elections of 2007. A few alleged that he had actually voted for the then opposition leader – Ernest Bai Koroma, instead of his former Vice President and chosen successor Solomon Berewa. 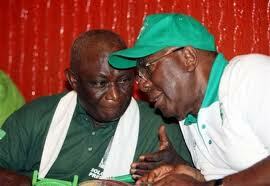 (Photo: Berewa and Kabbah campaigning for the 2007 elections). I have been asked on more than two occasions, why I had not advised my friend and boss to have the Chairman of the National Electoral Commission arrested and the 2007 elections themselves cancelled. 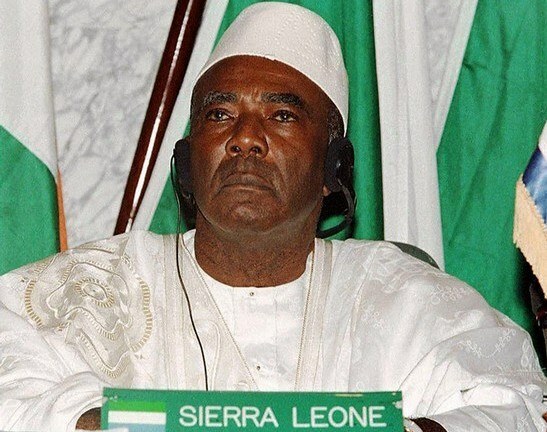 As far as the leadership and general membership of the APC were concerned, Tejan-Kabbah and his SLPP had done nothing for the country, after being in power for eleven years. Worse, that the erstwhile government left the country’s vault practically empty. The inference is clear, that the SLPP leader and his party were only good at declaring their development intentions and nothing else. 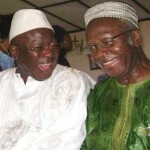 The standard times newspaper had published a fallacious and mischievous front page headline, stating that President Tejan-Kabbah had failed to inform the people of Sierra Leone about various gifts he had received, especially a consignment of rice from the late Libyan leader Colonel Gaddafi, until after the Libyan strong man announced it formally in the national stadium. We called a news conference to correct the false statement, and not a single journalist including the then President of the Sierra Leone Association of Journalists SLAJ – Alhajie Ben Kargbo and Reuters’ representative had raised a hand to say that it was not so. It was not generally known that the former President did not collect his salary when he was in office, but arranged that it should be distributed among needy courses. One of the beneficiaries was an elderly widow in Bonthe, whose only son had been murdered by the RUF, his body cut up and his liver forced down the throat of his weeping mother. Except on very formal occasions, Kabbah never had traffic clogged up by his presidential motorcade. He often drove down from Hill Station Lodge to State House without a siren sweep vehicle. And he would as far as was practicable, use the Regent Grafton Road in order to avoid central Freetown. The only occasions, on which he used blaring sweep vehicle sirens, was in Accra, Kumasi, and in Guinea, after he had stepped down from office. The late former President was extremely tolerant, and hardly ever reacted to the many vicious attacks on his person – both in and out of office. 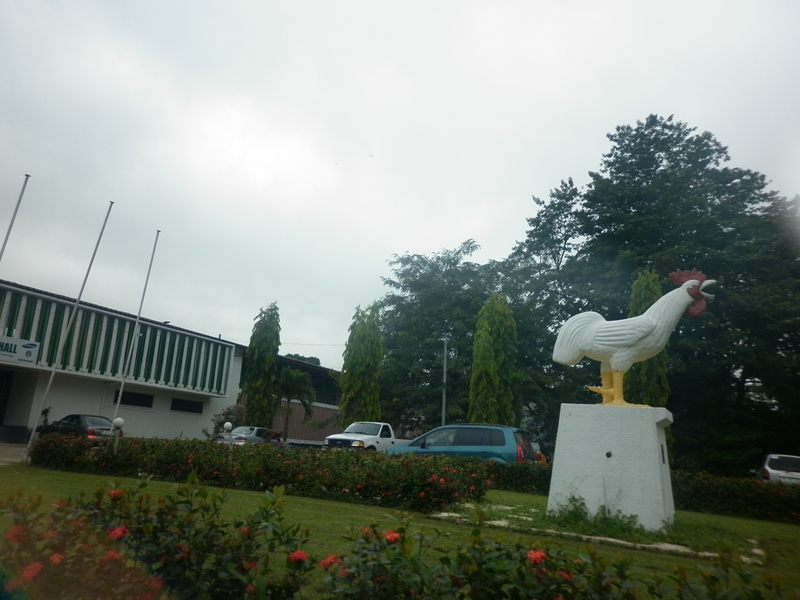 From the outset, the former President did not encourage any dialogue about extending his term of office to a third term, so that when he reminded the Special University congregation at the Kwame Nkrumah University of Science and Technology in Kumasi that there was life after state house, there was thundering applause. Mr. Tejan-Kabbah was very loyal to his friends and had accompanied me to Siama, Pendembu and Kailahun, when I was there because of bereavements in the family. On other occasions, he travelled to Daru to sympathize with flood victims; to Kenema for Mayor Brima Kargbo’s funeral; and to Bo for the late Fofana’s. Oswald Hanciles may be forgiven for being so disingenuous in his referral to Hinga Norman’s special court indictment, as a betrayal by the former President. But most people are well aware of why the Oswald Hanciles of this country, write what they do. But they deceive no one.